Canada's stock exchanges are global centre for resource industries. 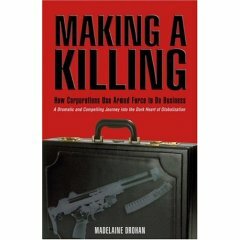 As a result, financial journalist Madelaine Drohan found herself acquiring an expertise in a subject more exotic than the usual balance sheets and trading reports - the use of armed force by private corporations. In 1998, Drohan was invited to war-torn Angola by Diamondworks. The company's majority shareholder Tony Buckingham, was a British former special forces officer with links to South African mercenary firm Executive Outcomes, which, Drohan learned, he hired out to weak African governments in exchange for mineral concessions. - The original use of Executive Outcomes to defend a concession owned by Canadian firm Ranger Oil from Angolan Unita rebels. - The attempt by Tim Spicer's Sandline to oust rebels in Sierra Leone, funded by fraudster Rakesh Saxena in return for diamond concessions. -Shell's activities in the Niger Delta, and its alleged complicity in human rights abuses by the Nigerain Police. -Canadian firm Talisman Energy's attempt to develop an oil concession in Sudan during the civil war there. -The business empire in the Congo created by Ugandan military officer Salim Saleh. -How Belgium's Union Minière supported Katanga's secession from Congo. -How Lonrho's Tiny Rowland paid off Mozambique's RENAMO rebels to protect an oil pileline while dealing with the FRELIMO government. Drohan touches only briefly on the trend for overt sponsorship of mercenaries by western states that was just emerging in Iraq and Afghanistan at the time this book was written. Making a Killing is most valuable on the guns-for-resources pattern pioneered by Tony Buckingham in Africa in the 1990s, which is a key part of the backstory of many of those involved in the private military industry in Iraq. It may also provide a pointer to the future of the industry once the 'Baghdad bubble' bursts.